Les Cayes, Haiti: Haiti and Jamaica urged residents in vulnerable coastal areas to evacuate and Cuba suspended flights on Sunday as bands of rain from Hurricane Matthew, the strongest storm to menace Caribbean nations since 2007, drenched the Jamaican capital. Matthew’s slow-moving center was expected to come near southwestern Haiti and Jamaica on Monday as a major storm bringing winds of 145 miles per hour (230 kph) and life-threatening rain, the US National Hurricane Center said. Eastern Cuba would also feel bands of fierce wind and rain on Monday, the agency said. He said 1,300 shelters had been set up, with the capacity to hold 340,000 people. Some two thousand people refused to leave their seaside homes in the coastal town of La Savanne and the government was ready to use force if needed, Anick Joseph said. One person was swept away by high waves on Saturday despite government warnings to stay out of the sea, he said. On Sunday afternoon, nobody had arrived at the largest shelter in La Savanne, a high school with the capacity to fit 600 people, except some boys playing basketball there. Up to 40 inches (101 cm) of rain could fall on parts of southern Haiti and the prime minister’s office issued a red alert warning for landslides, high waves and floods. In Kingston, Jamaica, major roads and waterways flooded as the first bands from Matthew lashed the island. Cars stalled as rain-drenched drivers tried to push vehicles through streets that flooded within minutes after the downpour started. In the nearby town of Port Royal, fishermen scorned government calls to leave for shelters. Matthew was about 265 miles (430 km) southeast of Kingston on Sunday night and moving northwest at 5 mph (7 kph), with a turn to the north expected overnight. The hurricane center ranked it at Category 4 on the five-step Saffir-Simpson scale of hurricane intensity. “Slow motion is almost always a bad thing for any land area impacted,” said John Cangialosi, a hurricane specialist at the center. Matthew was expected to remain a powerful hurricane into Tuesday, the center said. Matthew is the most powerful hurricane to form over the Atlantic since Felix in 2007. Haiti is the poorest country in the Americas, and a combination of weak government and precarious living conditions for most of its people makes it particularly vulnerable to natural disasters. More than 200,000 people were killed when a 7-magnitude earthquake struck Haiti in 2010. Despite worries about potential storm devastation, life in the southern Haitian town of Les Cayes went on much as normal. One of two restaurants at the tourist port was open but employee Jonel Glezil said there were no visitors on Sunday. Glezil, 28, said he was unprepared for the storm and worried about damage to the restaurant and the town of 70,000 residents, where streets are lined by tall, colorful houses and coconut and mango trees. In Jamaica, which could get up to 15 inches (38 cm) of rain, Prime Minister Andrew Holness told Reuters outside his office that his government was mobilized and about 80 percent of the 2.7 million Jamaicans were ready for the storm. “The damage will have an impact on our economic growth, which is already fragile,” he said, as the wind began to build. In particular, agriculture, tourism and towns cut off by storm damage and landslides would suffer, Holness said. Kingston residents stocked up on canned food, water and batteries, while banks and offices boarded their windows. Fishermen were told not to go to sea. In Cuba, where evacuations were under way, many flights were suspended by noon on Sunday. In the seaside village of Siboney, near Santiago de Cuba, villagers moved furniture to the safest houses. Some left for evacuation centers and others were preparing shelters in caves in the cliffs nearby. 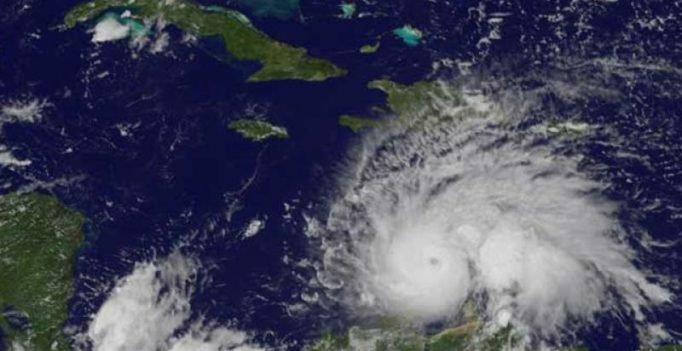 Cuban President Raul Castro warned that Matthew was stronger than Hurricane Sandy, which devastated Santiago de Cuba in 2012. “We have to prepare as if it has twice the power of Sandy,” the Granma newspaper quoted Castro as saying on a visit to Santiago de Cuba. A few miles east, the United States was airlifting some 700 spouses and children to Florida from its Guantanamo Bay naval base. Prisoners and service personnel would remain. Matthew could affect the Bahamas and the US East Coast later in the week, although forecasts so far out are often inaccurate. The US State Department issued travel warnings for the Bahamas, Jamaica and Haiti and authorized government workers’ relatives and non-essential personnel to leave. The latest operation in the Khyber district came just after the military said it had killed at least 14 militants in the same area Tuesday….